NEWPORT BEACH — Hollywood legend Jackie Gleason — the star and creator of “The Honeymooners” television series — was a comedic genius who also won kudos for his dramatic roles in films, including Minnesota Fats in “The Hustler.“ And he definitely enjoyed “living large.” Gleason’s parties were epic. He chartered entire trains to transport friends and co-workers in style. And he loved spending leisure time aboard his own private yacht. This aft cabin motoryacht originally was a 60-footer, but it has been completely refurbished to a nearly 70-foot length. An elegant and practical flybridge was added, giving Savoy three levels. Inside, Savoy has been lavishly appointed with fine handcrafted woodwork, beautiful furnishings and the latest entertainment systems. Savoy’s remarkably comfortable and luxurious living areas provide ample space for lounging and entertaining up to 49 guests aboard. Savoy offers three full staterooms — including a plush master stateroom with a king-size berth and a Jacuzzi — and full crew quarters. The plush salon offers leather furnishings, a card table and a custom theater-grade entertainment center. In the bar, there are side-by-side video screens for the ultimate sports viewing experience — and throughout, you’ll find satellite television, flat-panel video screens, Blu-ray DVD players and iPod audio docking stations. Savoy’s other notable features include a custom wet bar with refrigerator, water-maker, ice-maker and granite countertops; a spacious galley; air conditioning; two new Onan auxiliary generators; two Detroit Diesel 12v-71 inboards rebuilt to like-new; and an enviable 800-gallon fuel capacity. You can tour Savoy at the show — and if you want to take it home, Savoy’s boat show price is $945,000. Sterling BMW Newport Beach is the official show sponsor of this year’s Newport Boat Show. 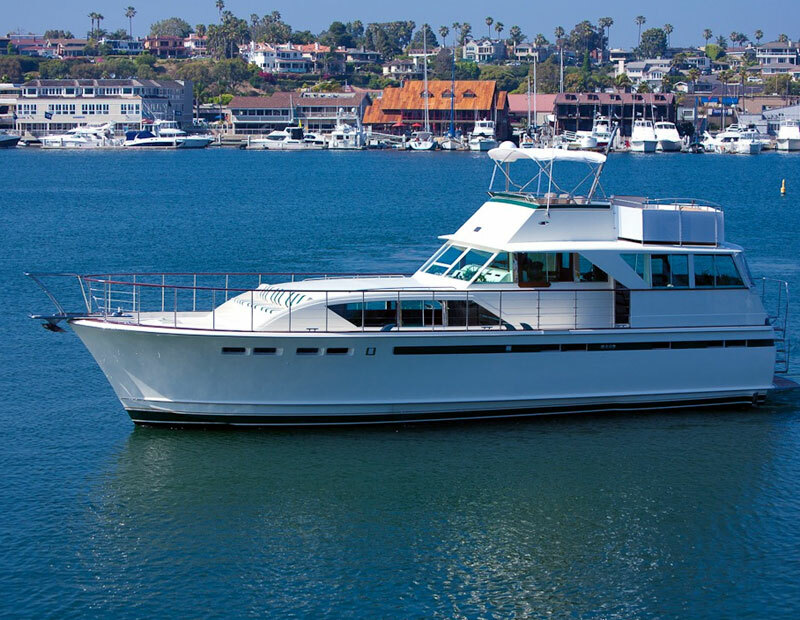 In addition to getting a rare opportunity to step aboard Savoy, show-goers will see many other remarkable brokerage vessels, and the latest large and midsize yachts to hit the West Coast. Attendees can also check out high-flying jet pack demonstrations from JetLev and see brand-new 6 Series and 3 Series BMW automobiles. In all, more than 200 brand-new yachts and ocean-tested brokerage boats — the West’s largest in-the-water assembly of large yachts for sale — will be presented at the 39th annual Newport Boat Show. Show-goers can step aboard, inspect and compare these unique vessels; along with seeing the latest boating gear, accessories and services. No matter if you’re searching for a new boat or the newest gear to update your current boat, the Newport Boat Show will provide a rare one-stop shopping venue where the best products are available — at special boat show prices. Lido Marina Village is located at Via Lido and Newport Boulevard in Newport Beach, one block south of Pacific Coast Highway. Show hours are: 10 a.m. to 7 p.m. Thursday through Saturday; 10 a.m. to 5 p.m. Sunday. Admission is $15 (credit cards accepted) for adults and free for children 12 and younger. Free offsite parking and continuous shuttle service will be available. Visit newportinwaterboatshow.com for complete details. The Newport Boat Show is produced by the Duncan McIntosh Co. Inc., publisher of Sea Magazine, Boating World, The Log Newspaper, FishRap and Editor & Publisher, and producer of the Lido Yacht Expo.